These PERUVIAN CHICKEN MEATBALLS WITH GREEN SAUCE are the perfect holiday or Super Bowl appetizer! The Peruvian green sauce, made with a parsley base, is just the right amount of spicy. The drop meatballs are just the right amount of easy. Combine all ingredients except the mayonnaise (or Greek yogurt) in a food processor fitted with the metal blade, a blender or a stick blender. If using a food processor (see note below), process on HIGH until a smooth paste forms. This could take a few minutes. Pause every minute to push the paste down from the sides with a rubber spatula. Once a smooth paste is created, add the oil with the processor on HIGH and process until paste is fully homogenous. Taste and, if necessary, season with kosher salt and freshly ground black pepper. *Note – if using a blender or a stick blender, add all except the mayonnaise. After the paste forms, add the mayonnaise or Greek yogurt and process 2 minutes on HIGH. Using a blender or stick blender creates a smoother paste. Refrigerate and reheat if using at a later date. In a medium mixing bowl, combine all ingredients and mix gently until all ingredients are well incorporated. Cover and refrigerate 30-60 minutes. Preheat oven to 400 degrees F. Cover a baking sheet with aluminum foil and spray lightly with non-stick cooking spray. After meat has been seasoned at least 30 minutes, remove it from the refrigerator. Scoop the ground chicken with a 1-inch scoop and drop the “meatballs” onto the prepared baking sheet with 1 inch between each meatball. Place the meatballs in the preheated oven and bake 12-15 minutes until meatballs are just cooked through. Do not overbake. Pour enough sauce in a small skillet to cover the bottom of the pan. Place the meatballs over the green sauce and cook over medium-low heat until sauce is heated through and meatballs are hot. 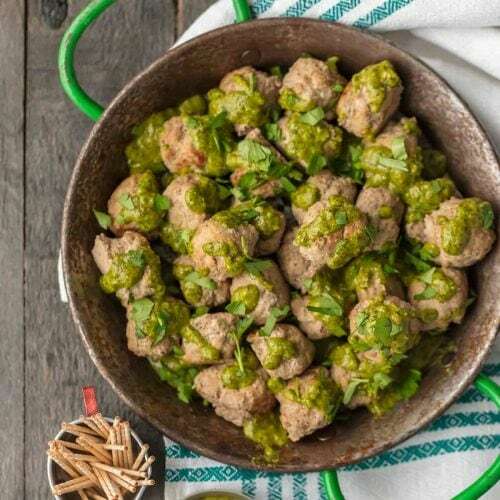 Drizzle the tops of the meatballs with green sauce and serve immediately. *The meatballs can be made up to two days ahead and the sauce up to 5 days ahead.